Some thought magic came from the mind, others the soul, or the heart, or the will. But Kell knew it came from the blood. Blood was magic made manifest. There it thrived. And there it poisoned. Kell had seen what happened when power warred with the body, watched it darken in the veins of corrupted men, turning their blood from crimson to black. If red was the color of magic in balance—of harmony between power and humanity—then black was the color of magic without balance, without order, without restraint. As an Antari, Kell was made of both, balance and chaos; the blood in his veins, like the Isle of Red London, ran a shimmering, healthy crimson, while his right eye was the color of spilled ink, a glistening black. I feel like there are so many reviews and praise of this book everywhere that I am going to make a list of all the things I like about this book. The writing. It’s concise, sharp, witty, and engaging. 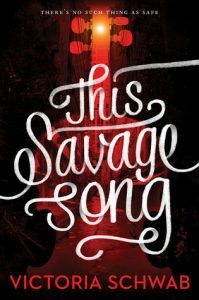 Sometimes I feel like I’m reading a book word for word, but Schwab manages to make reading absolutely effortless and a heck of a lot of fun. LONDON. 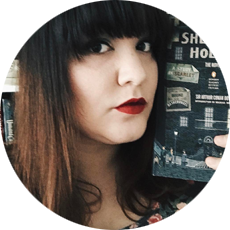 Like I mentioned in my last post, if there’s a book set in London, I’m sold, please give it to me to read, and this series has FOUR LONDONS. FOUR!!! 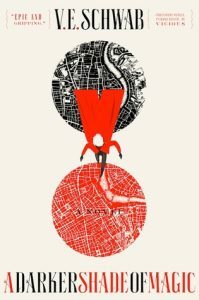 The world building never seemed confusing to me, didn’t seem forced, and I found it one of the most effortlessly magical worlds built in my recent reading experiences! Kell’s magical coat. I want a coat with that many sides and that many pockets. Just think of the snacks and books I could carry with me if I had a coat like that?? It’s violent and stabby and bloody. The magic. It seems simple and not very complex on the surface, but by the end of this, I feel like so much more can be explored in the scope of the magic, and I hope it is in the rest of the trilogy! The characters. They’re so varied and engaging and sassy and everything I like to find in a cast of characters. I waited to read the second until the third one was released, and now that I have all three, I’m reading the rest of the trilogy this year! It’s an incredibly hyped trilogy, but I find it’s well deserving of the hype it receives. I feel like I rarely give out five-star reviews, but I think V.E. 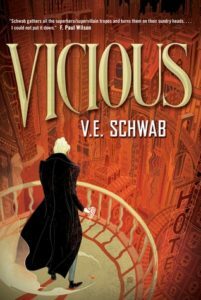 Schwab’s Vicious earned it by the end. It started out a bit slow for me (but that might also be attributed to a little reading slump), but once I hit the halfway mark, I was hooked and couldn’t put the book down. Vicious grapples with the superhero ideas of good and evil, hero and villain, and what results from all of the chaos each of two main characters create. Eli Ever is the self-regenerating, self-proclaimed hero after discovering the secret behind the creation of EXtraOrdinary people, often called EOs throughout the book. After his best friend Victor Vale becomes an EO, accidentally murder’s Eli’s girlfriend, and goes to prison, Eli makes it his mission to remove other EOs from the population. The book alternates between the present day with Eli being the ‘hero’ and the past with the beginning of Eli and Victor’s struggle to the present with Eli trying to take control over the EO population and Victor’s escape from prison to get to Eli. The alternating chapters threw me off at first, but then it fell into a really interesting rhythm, as if each chapter set in the past connected with each chapter in the present. One of the things I like most about Schwab’s stories is that every character feels relevant and feels fully developed. Vicious is a character-driven superhero story about that sometimes very fine line between good and evil and the complexities that each character faces. With obsession driving them both, the hero does some really terrible things and the villain does some really wonderful things. By the end of the book, we’re left with a lot to think about. In the face of adversity, ignorance, and power, who defines what is good and what isn’t?